Frequently, when I’m at book signings and speaking engagements, I am asked why I chose to write about the Civil War. To me, this is one of the most captivating times in U.S. history. I was never into history when I was in school, but over the years, I have developed an interest in certain aspects of world and American history, as well as genealogy. Perhaps this is part of becoming more mature, but curiosity has compelled me to search out my ancestors and find out just where, exactly, I came from. The same goes for writing about the War Between the States. I have always been interested in the Victorian era, especially after living in Colorado for 25 years and seeing the old mountain and mining towns that still exist. Some even have residents who live like people did in the late 1800’s. Of course, there’s Cripple Creek, Black Hawk, Central City, and Glenwood Springs, where Doc Holliday is buried. These places have always fascinated me, and they still do. While living in Colorado, I had the opportunity to visit Gettysburg. I had never seen a Civil War battlefield before, so when I did, you can imagine how awestruck I was. It impressed me so much that I was inspired to write my first novel, A Beckoning Hellfire. From there, the book expanded to a series. After I wrote three books in the Renegade Series, I went back and wrote the prequel, A Beautiful Glittering Lie. While researching my first novel, I came upon some information about my husband’s family. After a genealogy search, we learned that his great-great grandfather was a Cherokee interpreter who fought under General Nathan Bedford Forrest. It just goes to show what you can discover when you start digging! Harvey Alexander Logan (1867 – June 17, 1904) had a rough beginning, and things never really improved for him. He was born in Tama County, Iowa, and his mother died in 1876. 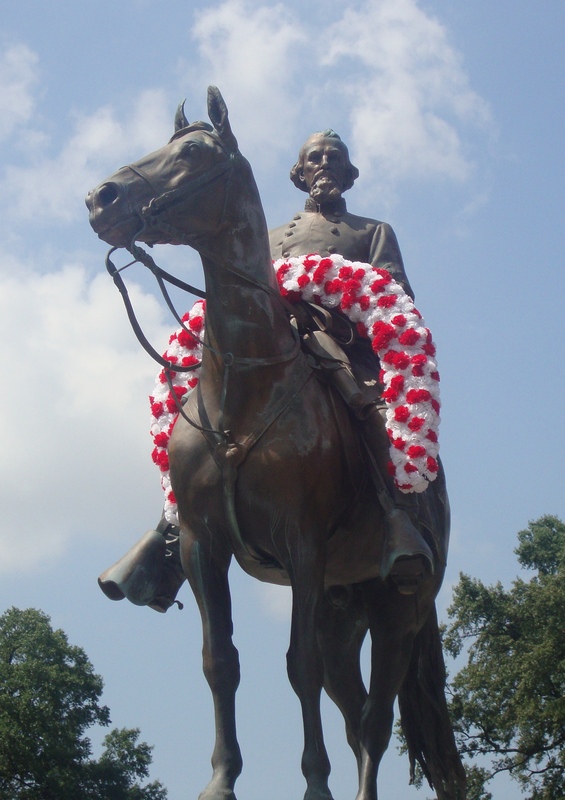 Logan’s three brothers went to Missouri, but he ended up in Texas breaking horses. He met George “Flat Nose” Curry there, and took his last name, as did his brothers. All of the Curry boys were heavy drinkers, and Kid loved to spend his paychecks on booze and prostitutes. After Kid became famous, prostitutes claimed that their babies were his, and these children came to be known as “Curry Kids.” Rumor has it that he fathered 85 kids, but in reality, he probably fathered less than five. In 1883, Kid rode on a cattle drive to Pueblo, Colorado, got involved in a saloon brawl, and fled to Wyoming. His brothers went to Montana and established a ranch there. Kid got in a fight with a neighbor, Landusky, and ended up killing the man. He hooked up with outlaw and train robber “Black Jack” Ketchum, and started riding with his gang. In 1896, Landusky’s brother came after him to claim the bounty, but Kid and two of his brothers confronted him. One of his brothers was killed in the shootout. Kid and his brothers went to work on a ranch near Sand Gulch, Colorado. While there, they established their own gang. They robbed a bank in Belle Fourche, South Dakota, but a posse chased after them, and Kid was captured, along with his brother and another member of their gang. The men were held in the Deadwood, South Dakota jail briefly before they attacked the jailer and escaped. They went back to Montana and held up two post offices. Kid started riding with the Wild Bunch gang under Butch Cassidy. He acquired the nickname, “the fastest gun in the West.” (The Sundance Kid, as portrayed in the movies, was not a gunman, and that character was actually based on Kid Curry.) On June 2, 1899, the gang held up the Union Pacific Railroad near Wilcox, Wyoming and escaped. The Pinkerton agents were on their trail, but the gang escaped to their hideout, the Hole-in-the-Wall. Curry went to Utah, and then Alma, New Mexico. After robbing another train, members of the gang were captured and killed. Kid, Butch Cassidy, and other members escaped and went to San Antonio. In February 1900, Kid’s only surviving brother was killed. Kid went on a vendetta shooting spree through Arizona and Utah before returning to Montana to reconnect with the Wild Bunch gang. They robbed a Great Northern train in Wyoming. In 1901, many members were captured in Tennessee. Kid returned to Montana, and killed a rancher who he held responsible for one of his brothers’ deaths. In 1902, Kid went to Knoxville, Tennessee, where he was captured. He was convicted of robbery and sentenced to 20 years of hard labor, but on June 27, 1903, he escaped prison. A year later, on Jun 7, 1904, Kid was tracked down by a posse to Parachute, Colorado. A member of the posse shot him, and to avoid capture, Kid shot himself in the head. Rumors spread that Kid Curry was not actually killed in Parachute, and that it was another gang member. Supposedly, Kid escaped to South America with Butch Cassidy and the Sundance Kid. Charlie Siringo, one of the Pinkerton’s, resigned after believing that they had killed the wrong man. 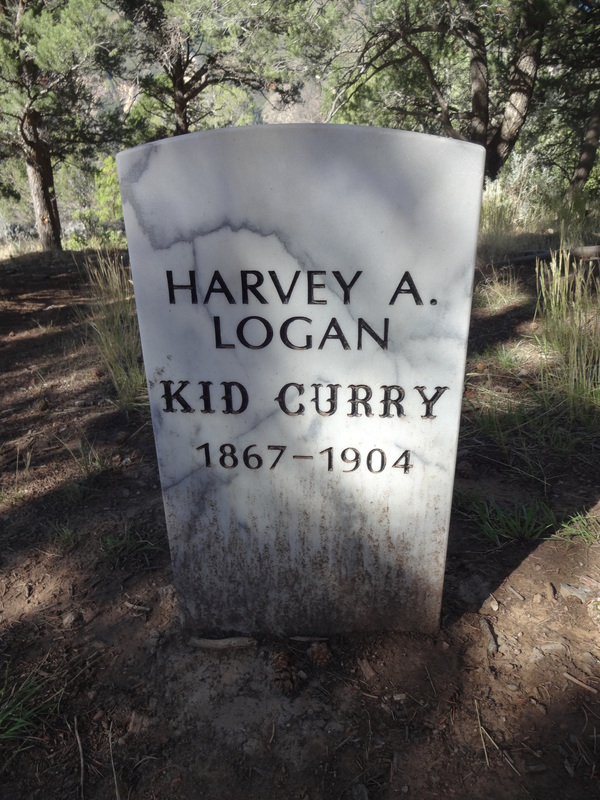 Curry is buried in Linwood Cemetery in Glenwood Springs, Colorado. (Doc Holliday is also buried there.) Kid Curry’s sad life never had a happy ending. If the rumors are false, he died as violently as he lived. Doc was born on August 14, 1851 in Griffin, Georgia. The family moved to Valdosta, Georgia in 1864. 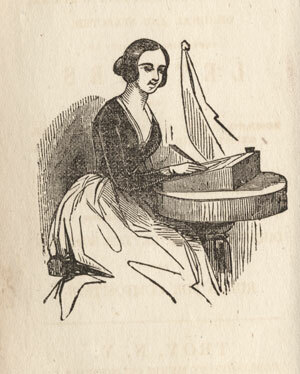 In 1866, when Doc was 15, his mother died of tuberculosis. He became fluent in Latin, Greek, and French, and obtained a degree in dentistry in Philadelphia. He didn’t practice dentistry for long, though. He was diagnosed with tuberculosis, and only given a few months to live. Thinking that a dryer climate would slow his deteriorating condition, Doc moved to Dallas in 1873 and took up gambling because it was more profitable. From there, he moved to Denver. Hearing about the discovery of gold, he traveled to Cheyenne, and then to Deadwood. By 1877, Doc had become accomplished with a gun. He met Wyatt Earp in Texas, along with “Big Nose” Kate, who became his lifelong companion. 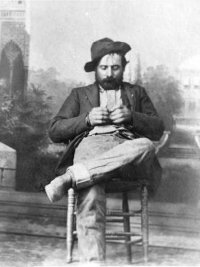 In 1878, he defended Earp in a saloon fight, which took place in Dodge City, Kansas. In 1880, Doc travelled to Tombstone, Arizona to meet up with the Earp’s. It wasn’t long before trouble found him. Wyatt had been dealing with problems caused by the “Cowboys,” and the situation escalated. In October 1881, the conflict exploded in what became known as the Gunfight at the OK Corral. The situation in Tombstone grew worse. Virgil Earp was seriously wounded, and Morgan Earp was killed. The Earp’s left town, but later, the body of Frank Stilwell, who was one of the Cowboys, was discovered near the railroad tracks, riddled with buckshot. The Earp’s returned to Tombstone to meet up with Texas Jack Vermillion. From there, the posse rode out on what became known as the Earp Vendetta Ride, and killed other members of the Cowboys, including “Indian Charlie” Cruz and “Curly Bill” Brocius. Because there was a warrant out for Doc in the killing of Stilwell, he decided to return to Colorado. Doc was arrested for murder in Denver on May 15, 1882 under an Arizona warrant. Wyatt asked his friend, Bat Masterson, who was Chief of Police in Trinidad, Colorado, to get Doc released. Masterson convinced Colorado’s Governor Pitkin to refuse Arizona’s extradition. Doc was released in Pueblo two weeks later. He and Wyatt briefly met up in June 1882 in Gunnison. On July 14, one of the notorious Cowboys, Johnny Ringo, was found dead. His death appeared to be a suicide, but controversy surrounds it. Speculation arose that Wyatt and Doc returned to Arizona to do Johnny Ringo in, but it has never been proven. After traveling to Salida, Doc went to Leadville for a short time. His health was rapidly deteriorating, worsened by severe alcohol and laudanum use. Told that the hot springs would improve his condition, he went to Glenwood Springs. The sulfuric fumes did just the opposite, however, and it wasn’t long before his health failed. He spent his last few days in the Hotel Glenwood. His final words reflected the irony of his situation, because he always thought he would be the victim of an assassin’s bullet. Looking down at his bootless feet, he said, “Damn, this is funny.” He died on November 8, 1887. He was 36 years old. Doc was buried in Linwood Cemetery, on a mountaintop overlooking Glenwood Springs. Speculation exists as to whether he is actually buried there, since the ground might have been frozen. He was either buried in an unmarked grave to prevent grave robbers from desecrating the corpse, or in Potter’s Field, which was a section of the cemetery set aside for blacks and paupers. He was penniless at the time of his death, so this is a possibility. The records showing exactly where his body was located within the cemetery were lost. According to research, he only killed three people in his lifetime. However, it is possible that he never actually killed anyone. He was involved in several altercations, and let his reputation grow as a murderer. Virgil Earp told a reporter from the Arizona Daily Star in March 1882, that “There was something very peculiar about Doc. He was gentlemanly, a good dentist, a friendly man, and yet outside of us boys I don’t think he had a friend in the Territory. Tales were told that he had murdered men in different parts of the country; that he had robbed and committed all manner of crimes, and yet when persons were asked how they knew it, they could only admit that it was hearsay, and that nothing of the kind could really be traced up to Doc’s account.” The violence experienced during the Civil War was carried on through the settling of the Wild West, and Doc Holliday was one result of that time. At the top of a red shale mountain sits Linwood Cemetery. The town of Glenwood Springs lies serenely below. The cemetery, which is now known as Pioneer Cemetery, is the oldest graveyard in town. The earliest headstone inscription is dated 1875, and the most recent is dated 1967. The cemetery plays host to several Civil War veterans. Most fought for the Union, and most have unmarked graves. 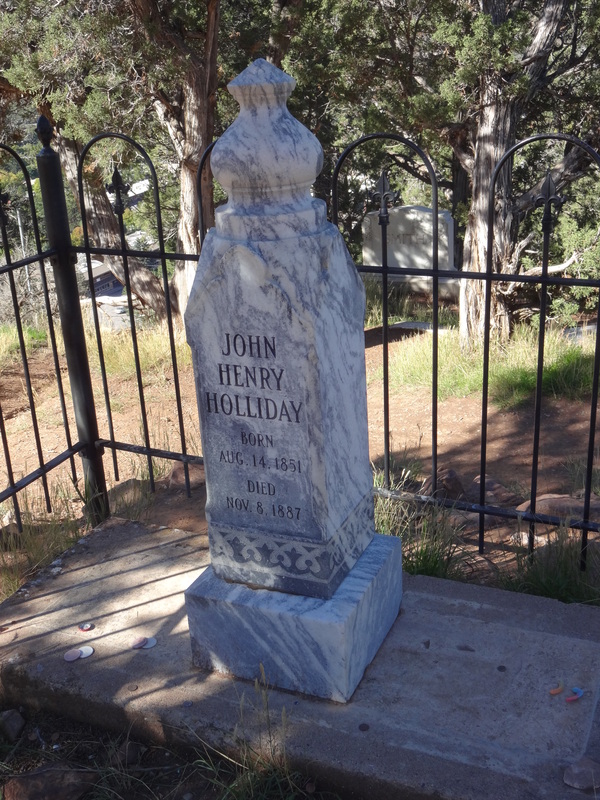 Linwood Cemetery’s most famous resident, however, is none other than Doc Holliday. Legend has it that John Henry Holliday came to Glenwood Springs because he heard the hot springs would relieve his tuberculosis. However, they only aggravated his symptoms. He died in November 1887. Some say he was buried in the basement of a house at the base of the mountain, because the rocky, 3/4 mile trail leading up to the grave was too muddy for a horse to climb with a hearse. Others say he is buried in Potters Field, which is a section in the cemetery designated for paupers. I’ve been told that no one knows exactly where he’s buried, because the townsfolk were afraid the grave would be robbed by souvenir hunters. Doc Holliday’s father fought for the Confederacy during the Civil War. Another famous resident interred in Linwood Cemetery is Kid Curry. He was a member of Butch Cassidy and the Sundance Kid’s Wild Bunch, and was supposedly one of the wildest in the bunch.